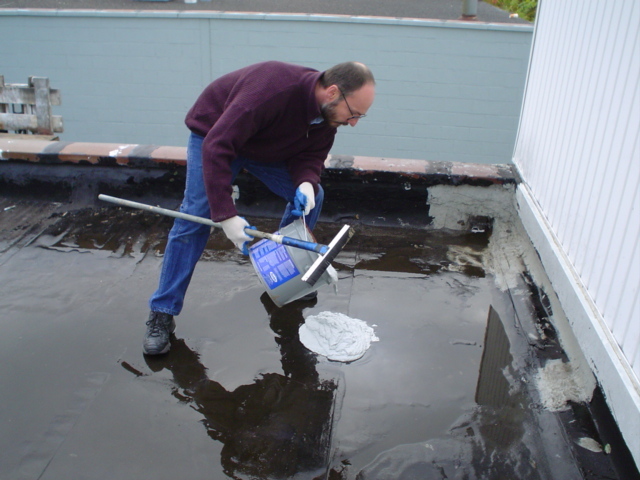 RUBBERKOTE 1047 is a revolutionary waterproofing coating that is uniquely designed to be applied to wet or damp roofs where curing will proceed even underwater! 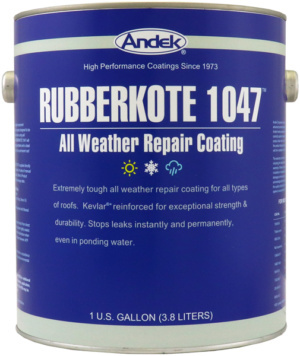 Yet unlike quick patch materials that have a short life expectancy, Rubberkote 1047 is guaranteed to last for five years! Rubberkote 1047 will adhere to all common roofing substrates and is ideal for either instant roof repairs or as a permanent roof coating. Will cure underwater regardless of applied coating thickness. Apply straight out of the container by brush or roller. Uses DuPont Kevlar® technology to achieve super strength and durability. Will not re-emulsify or wash away with water. May be used on vertical, pitched and horizontal surfaces, and withstands ponding water. Will not stain coatings applied over it. Can be used over BUR, capsheet, modified bitumen, steel, aluminum, tin, concrete, fiberglass and other surfaces. Although only minimal preparation is required, all loose material, stones and grease should be removed, together with as much dust, rust and standing water as is reasonably possible. Bird excrement, algae and slime mold should be scrubbed off of the surface for best adhesion results. All holes, gaps and joints should be bridged with ROOFAB sandwiched between sufficient RUBBERKOTE 1047 to provide thorough wetting of the roof surface and thorough saturation of the ROOFAB. This is best accomplished by “stippling in” with a brush. RUBBERKOTE 1047 may be applied in 2 coats of 20 wet mils thickness each over capsheet, modified, metal, transite or concrete after the above preparation is complete. The 1st coat may be applied directly over any fresh, wet repairs as curing will proceed regardless of thickness although slower. The 2nd coat may be applied as soon as the 1st coat is sufficiently dry to walk on (normally 2-3 days at 65°F). Care should be taken not to disturb any patches or pre-treatments as they may still be wet. RUBBERKOTE 1047 may be applied over asphalt or coal tar B.U.R. after the preparation described above has been completed. The 1st coat should be applied at 66 square feet per gallon; ROOFAB laid into it and thoroughly “stippled in” by brush with a 2nd coat at 66 square feet per gallon to remove all tents and voids. The Roofab should be overlapped by at least 2 inches and thoroughly saturated with RUBBERKOTE 1047 so that no dry spots remain. Approximately 60 hours at 80°F (27°C) and 70% RH. Approximately 7 days (to 36 deg. Shore ‘A”‘) 80°F (27°C) and 70% RH. Clean tools and equipment with Mineral Spirits.